The focus of this book is to analyse from a number of perspectives the politics of change in Ireland north and south since 1969. The emergence of the troubles in Northern Ireland, the final push to gain entry to the EEC, changing social mores and severe economic difficulties all begin to appear on the horizon at this stage. While considerable change and, indeed, moments of extreme crisis, have taken place in areas such as Northern Ireland, the economy, moral politics, and Ireland’s attitude towards the European Union, continuity has also been a significant hallmark of Irish politics since 1969. 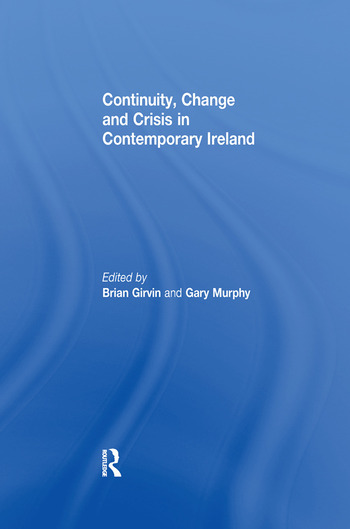 This volume offers important perspectives and opens up new debates in explaining the phenomena of continuity, change and crisis in contemporary Ireland. New evidence on the origins of the troubles in Northern Ireland, the Arms Crisis, Ireland’s relationship with Europe, the process of social partnership, and the politics of morality all offer important fresh insights into how contemporary Ireland has functioned. Featuring a number of high profile scholars and uniquely dealing with both Northern Ireland and the Republic of Ireland, this volume argues that the intriguing feature of recent Irish history is not the absence of change but the extent to which change has been mediated by the existing political cultures, national traditions and long-standing institutions of both north and south. This book was based on a special issue of Irish Political Studies. Brian Girvin is Professor of Comparative Politics at the Department of Politics, University of Glasgow. His main research interests lie in American politics, nationalism and the comparative analysis of the contemporary world. He has a special interest in Irish politics, both north and south and has written extensively on modern Ireland. Gary Murphy is Associate Professor of Government at the School of Law and Government, Dublin City University. His main research interests are based around interest groups and lobbying. He has published widely on modern Irish politics most notably in the area of interest group behaviour. His major reinterpretation of postwar Ireland, In Search of the Promised Land is published in 2009. He comments extensively on Irish politics in the media.